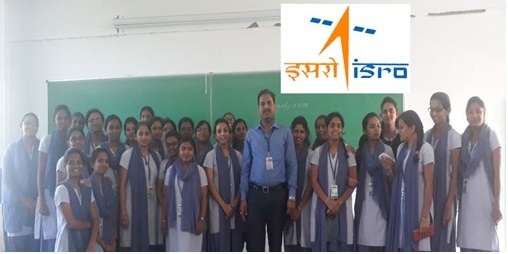 The Department of Information Science and Engineering became a part of this esteemed organization in the year 2003 with intake of 60 students. It is recognized by All India Council for Technical Education, New Delhi, India and affiliated to Visvesvaraya Technological University, Belagavi, Karnataka. The course has become popular among students due to the achievements and rigor. The department has well equipped classrooms and computer laboratories with high-end systems supporting Wi-Fi facility.The Department has 13 professionally qualified faculties with required experience and 3 technical staff members, committed to continuously improve the quality of education by enhancing the knowledge of students. To be recognized nationally as an accomplished department producing global leaders and researchers as committed, enthusiastic and excellent ethical women technical graduate for the better tomorrow. M1: To provide Students with Innovative and research skills, which is need of the hour for technical students. M2: To impart knowledge to the students of Information Science and Engineering with relevant core and practical knowledge inculcating real time experience in the promising field of computing. M3: To prepare the graduates to meet information technology challenges with a blend of social, human, ethical and value based education. PEO1: To produce graduates who have the ability to demonstrate technical competence in the fields of information Technology and develop solutions to the problems. PEO2: Gain the ability to analyze and solve Information science and engineering problems through application of fundamental knowledge of maths, science, and engineering. PEO3: To endeavor innovations with a substantial fundamental technical skills aiming the career in research and development. PEO4: Understand and deal with ethical, societal and global issues associated with the computing profession. PEO5: Exhibit professionalism, leadership roles, team work in meeting the growing demands of IT industry. to solve problems related to engineering and technology. appropriate for wealth, safety, social & environmental considerations. PO4. Design of experiments, analysis and interpretation of data to provide valid conclusions. activities with the understanding of limitations. PO6. Understanding of professional and ethical responsibilities. PO8. Enabling with the administrative skills related to project management. PO9. Providing the scope to work on a research problem. manage projects and in multidisciplinary environments. The following Pie Chart shows the distribution of course content, representing blending of subjects of different skill area from first to eight semesters (percentage wise). The department has 8 well equipped laboratories. The laboratories are supported with softwares such as Oracle 10, Ubuntu, MySQL, NS2 simulator, Eclipse, Apache Web Server and JDK, Windows 7, Linux Fedora 14,Visual studio 2008 2010,2012, Microsoft Packages. IBM SERVER -17" CRT Monitor, CPU - IBM X2226 Server , Xeon 3 GHz Dual Processor, 2 GB Ram, 73 GB SCSi Hard Disk, Tape Drive (4 GB). To get exposure to Server Side Scripting, Perl & PHP programming. To understand and implement algorithms related to graphs and backtracking. To understand various sorting and traversal algorithms. To develop and execute algorithms at Data Link Layer, Network Layer, Cryptographic Algorithm, Socket Programming with IPC Communication. To develop and execute programs using 8086 assembly language using assemblers like MASM/TASM. • To create Databases with different types of Integrity Constraints and use the SQL commands such as DDL, DML, DCL, TCL to access data from database objects. • To learn the use of a Front End tool like VB. To understand the principles & techniques of File Structure Design and implementing them within a file system such as sequential file, B tree, B+ tree, hashing. HP Laser Jet Pro 1606N Printer – 1 No. Design and implementation of Multiplexer, Flip Flops, Counters, D/A Converter. Design and construction of Clippers, Clampers, Schmitt Trigger, Relaxation Oscillator, CE Amplifier & Multivibrator. To do innovative work applying the knowledge gained from various courses undergone in the earlier years. To exhibit both analytical and synthetically skills. Identify and understand the working of key components of a computer system. To understand basic principles of programming in C language. APLAB 15KVA 3PH -1PH UPS providing backup for all the labs. Tutorial Hall supported with Glass Board. A Memorandum of Understanding (MOU) was formally signed between GSSS Institute of Engineering and Technology for Women (GSSSIETW), Mysuru and VSG Software Solutions, Mysuru organized by the Department of Information Science & Engineering on 16th July 2018. The signatories of the MOU were Dr. M Shivakumar , Principal, GSSSIETW, Dr. Reshma Banu, Professor and Head, Department of ISE, GSSSIETW, Sri Karthik Ganapathi, Managing Director , VSG Software Solutions, Mysuru Deliverables of MOU include exposure of students to real time industry opportunities. A skill based vocational training center to be established imparting industry training, hands-on workshop program, training programming on topics related to curriculum. 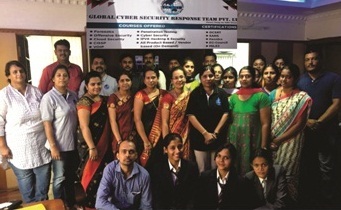 To set up Network Forensics Lab at Department of Information Science &amp; Engineeering, a Memorandum of Understanding (MOU) was formally signed between GSSS Institute of Engineering and Technology for Women (GSSSIETW), Mysuru and Nihon Communications Solutions Pvt Ltd(NCS), Bengaluru on 1 st February 2017. The signatories of the MOU were Dr.Sumithra Devi K.A, Principal, GSSSIETW, Sri. R K Bharath, CEO and Management Committee Member, GSSSIETW, Dr. Reshma Banu, Professor and Head, Department of ISE, GSSSIETW, Dr. S. Meenakshi Sundaram , Professor and Head Department of CSE, GSSSIETW , and Sri M S Phadke , Director , NCS Pvt Ltd, Benagluru. On this occasion Sri M S Phadke , Director , Nihon Communications Solutions Pvt Ltd addressed the students about the latest technologies in the Networking fields such as IoT and Clouds of virtualization. The objectives of setting up Network Forensics Lab is to expose students to the real time industrial opportunities. The Lab may be used to conduct Mini projects, Main projects, makethon camps and project development purpose. The facility can also be used for Research and Development by faculty members. A Memorandum of Understanding (MOU) was formally signed between GSSS Institute of Engineering and Technology for Women (GSSSIETW), Mysuru and Spaneos Software Solutions, Bangalore organized by the Department of Information Science & Engineering on 9th November 2015.The signatories of the MOU were Dr. Sumithra Devi K.A, Principal, GSSSIETW, Dr. Reshma Banu, Associate Prof and Head, Department of ISE, GSSSIETW, Sri. Venkatesh N, General Manger, Spaneos Software Solutions, Bangalore Sri. R K Bharath, CEO and Management Committee Member, GSSSIETW, Sri. Suraj Venugopal, Business Development Manager, Spaneos Software Solutions, Bangalore and Smt. Ayesha Taranum, MOU Coordinator, Department of ISE, GSSSIETW, graced the occasion. Sri. 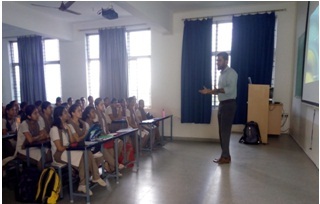 Venkatesh N , General Manger, Spaneos Software Solutions, Bangalore, reveled the hot technologies in the market such as Big Data, Hadoop, SAN and objectives of MOU to setup incubation Lab and Excellence Center for the Department of Information Science and Engineering, GSSSIETW, Mysuru and also highlighted the different exposures and opportunities for the students. To set up the Research Laboratory and provide research facilities for students and faculty members. To provide resource persons to conduct workshops, technical talk, conferences and training programs(with hands on session). To provide Internship, industrial visits and assist students for placements. IBM Center of Excellence: The Center has trained staff and students of the department in IBM tools like DB2, RAD, RFT, LOTUS, TIVOLI and RCT. Students are certified in the above tools. Students at MOU signing between VTU and IBM, along with the launch of “TGMC for Smart Apps” at Bengaluru on 15th October 2015. Mr. Aditya Hatwar, Research Engineer, Data Science Analytics Group, Ola, Bengaluru. Ms. Nethra M,Ms Manjushree Mashal Software Engineers, Nihon Communication Solutions Private limited, Bengaluru. VII Semester 18th September 2017. 8 Technical talk on “An overview on Software Development Life Cycle and Testing Life Cycle” Shruthi M J, Senior QA, Excel Soft, Mysuru 19th August 2017. 10 Three Day Workshop on “Network Traffic Analysis in Real time using Monosek” Ashish Srivastava, Software Engineer & Hrushikesh Inamdar, Application Engineer, Nihon Communication Solutions Private Limited, Bengaluru 7th, 8th & 9th of August 2017. 13 Technical Talk on “Recent Trends on IoT and Cloud Servers” Chandraprasad R, Senior Team Lead, Theorem, Mysuru 11th November 2017. 15 Technical Talk on “Implementation of Networking Ideas using Hardware Kit” Radhakrishna, Senior Software Engineer, Mar Labs Software Pvt. Ltd., Mysuru 11th November 2017. 16 Technical Talk on “Android & its Evolution” Tejas, Web Developer, Theorem, Mysuru 11th November 2017. 17 Technical Talk on “IoT using Raspberry Pi” Anireekshith N, Senior Engineering Specialist, Software AG, Bengaluru 28th October 2017. 18 Technical Talk on “Robotic Process Automation and Analytics” Sivaramakrishnan N, Senior Software Developer, Infosys Pvt Ltd., Mysuru and Mr. Santhosh, Technology Evangelist, Digital Academy, Infosys Pvt. Ltd., Mysuru 28th October 2017. 19 Technical talk on “Software Engineering with Industrial Perspective” Sandeepa D, Associate Consultant Engineer, Global Logic Pvt. Ltd., Bengaluru 28th October 2017. 20 Technical Talk on “Test Automation” Devaraj, Senior Software Engineer, Mar Labs Software Pvt. Ltd., Mysuru 28th October 2017. 21 Technical Talk on “Trends & Techniques in Software Engineering” Dharshan A H, Senior Consultant, All State Solution, Bengaluru 9th September 2017. 22 One day Workshop on “Developing Web Applications with Java” Sunil Kumar N, Technology Specialist, HPE & Sreenivasa Murthy N, Senior Software Engineer in Linus Technia, Bengaluru 9th September 2017. 23 Technical Talk on “Exploring IT Opportunities” Rohith T.D, Senior Project Lead, Oracle, Bengaluru 19th August 2017. 24 Technical Talk on “Agile Industry Perspectives and Project Excursion” Mallikarjuna CEO, Elephantry Technologies Pvt Ltd., Bengaluru 19th August 2017. 25 Technical Talk on “Mongo DB-Open Source Database” Chethan P, Technical Lead, Theorem India Pvt. Ltd., Mysuru 12th August 2017. 26 Technical talk on “Software Testing and its Formal Approaches” Prem Kumar Singh Test Manager, Infotech Pvt Ltd., Bengaluru 12th August 2017. 33 One day workshop on “User Interface Development Tool” Mahesh, CEO, Spaneos Software Solutions, Bengaluru 11th March 2017. Nagraj B M, Member, Education and Research Dept., Infosys, Mysuru. 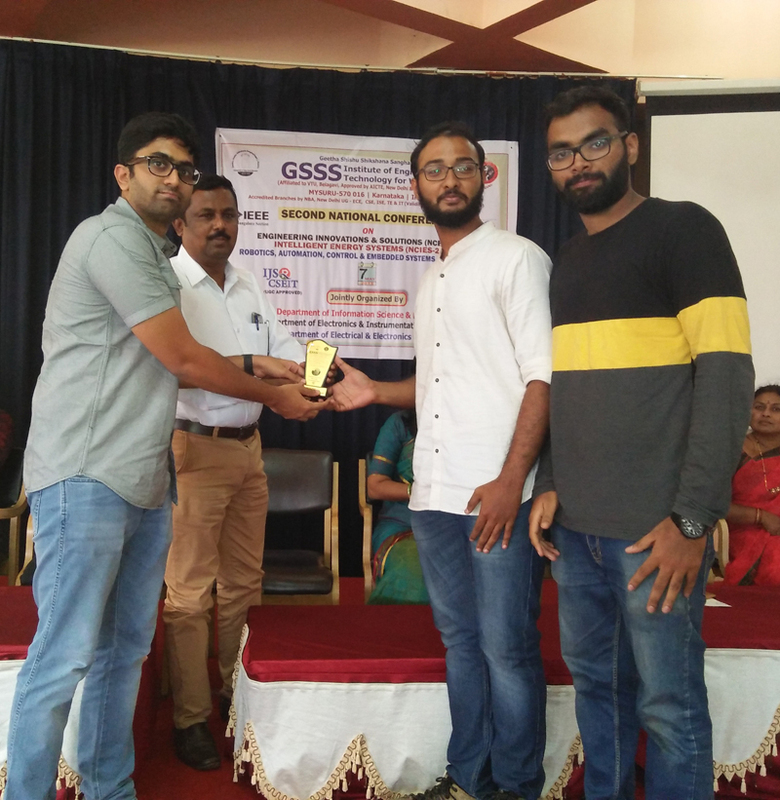 15 Technical Talk on "A Practical Approach to Software Engineering"
Won BEST project award for “IOT based Delivery Boys Safety Control and Bike Analyzer”, at State Level Seminar & Exhibition held at Bapuji Institute of Engineering and Technology Davangere funded by Karnataka State Council for Science and Technology (KSCST). 27th to 28th April 2018. 11th April to 13th April 2018. Attended Workshop on CISCO Packet Tracer, IEEE Convention held at NIE, Mysuru. 16th and 17th March 2018. 4th and 5th February 2018. 2nd & 3rd May 2016. 18th and 19th Feb 2016. Receiving “Best Accredited Student Branch Award”: Dr. Shivakumar M, Principal, GSSSIETW, Mysuru, Dr. S Meenakshi Sundaram, Professor & Head, Dept. 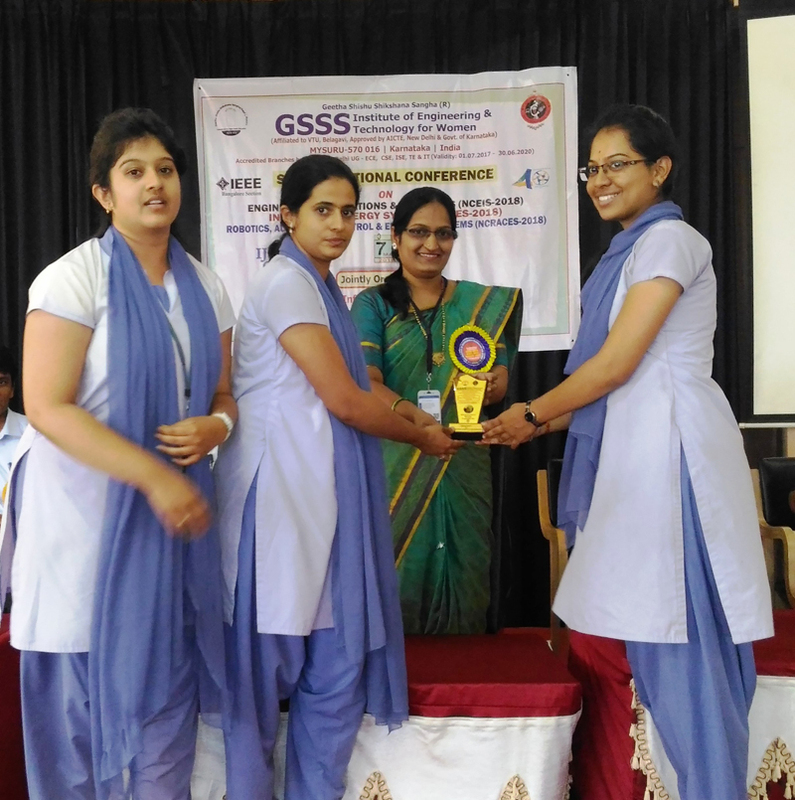 of CSE, GSSSIETW, Mysuru, Dr. Reshma Banu, Professor & Head, Dept. 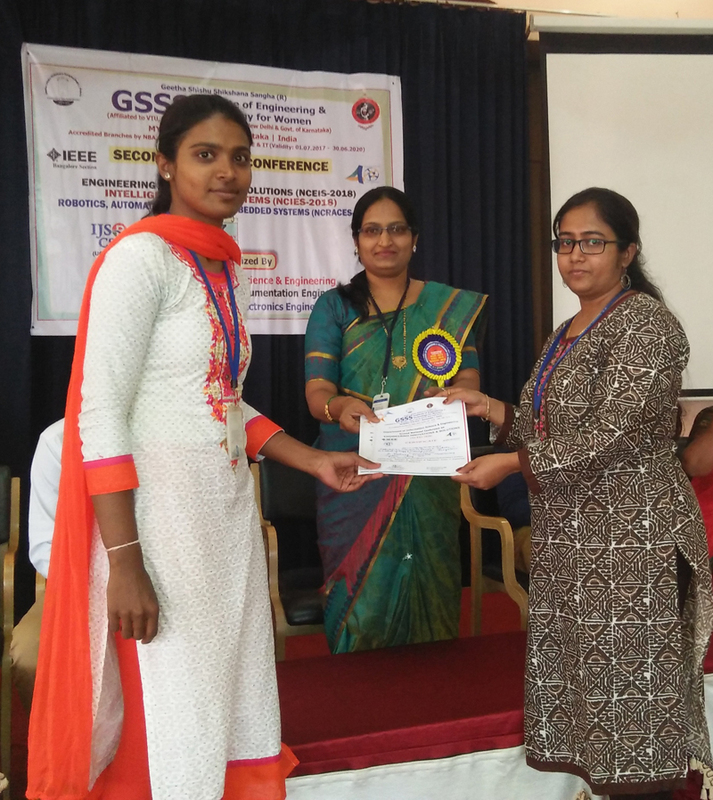 of ISE, GSSSIETW, Mysuru in the presence of Dr. T N Nagabhushana (in the middle), Principal, SJCE, Mysuru and Mrs. K A Anitha Venkatesh, Chairperson, CSI, Mysore Chapter. CSI Awards Committee-2017 chaired by Dr Anirban Basu, Chairman, Computer Society of India, has selected the CSI Student Chapter of “GSSS Institute of Engineering & Technology for Women, Mysore” as the “Best Accredited Student Branch Award” during the CSI Annual Convention 2017 held in the month of January at Kolkata. This award was received by Dr. Shivakumar M, Principal, GSSSIETW, Mysuru, Dr. S Meenakshi Sundaram, Professor & Head, Dept. of CSE, GSSSIETW, Mysuru, Dr. Reshma Banu, Professor & Head, Dept. of ISE, GSSSIETW, Mysuru at the valedictory function of One day seminar on “Indian Language Computing” held on 27th March 2018 at SJCE Mysuru. This event was jointly organized CSI Mysore Chapter and SJCE Mysuru. Technical talk on “Software Testing and its Formal Approaches” for III Semester Students was conducted by Prem Kumar Singh Test Manager, Infotech Pvt Ltd., Bengaluru on 12th August 2017. Technical talk on “Mongo DB-Open Source Database” for V Semester Students was conducted by Chethan P, Technical Lead, Theorem India Pvt. Ltd., Mysuru on 12th August 2017. Technical talk on “Agile Industry Perspectives and Project Excursion” for VII Semester Students was conducted by Mallikarjuna CEO, Elephantry Technologies Pvt Ltd., Bengaluru on 19th August 2017. Technical Talk on “Exploring IT Opportunities” for V Semester Students was conducted by Rohith T.D, Senior Project Lead, Oracle, Bengaluru on 19th August 2017. One Day Workshop on “Developing Web Applications with Java” for VII Semester Students was conducted by Sunil Kumar N, Technology Specialist, HPE & Sreenivasa Murthy N, Senior Software Engineer in Linus Technia, Bengaluru on 9th September 2017. Technical talk on “Trends & Techniques in Software Engineering” for III Semester Students was conducted by Dharshan A H, Senior Consultant, All State Solution, Bengaluru on 9th September 2017. Technical talk on “Test Automation” for III Semester Students was conducted by Devaraj, Senior Software Engineer, Mar Labs Software Pvt. Ltd., Mysuru on 28th October 2017. Technical talk on “Software Engineering with Industrial Perspective” for I Semester Students was conducted by Sandeepa D, Associate Consultant Engineer, Global Logic Pvt. Ltd., Bengaluru on 28th October 2017. Technical talk on “Robotic Process Automation and Analytics” for V Semester Students was conducted by Sivaramakrishnan N, Senior Software Developer, Infosys Pvt Ltd., Mysuru and Mr. Santhosh, Technology Evangelist, Digital Academy, Infosys Pvt. Ltd., Mysuru on 28th October 2017. Technical talk on “IoT using Raspberry Pi” for VII Semester Students was conducted by Anireekshith N, Senior Engineering Specialist, Software AG, Bengaluru on 28th October 2017. Technical talk on “Android & its Evolution” for V Semester Students was conducted by Tejas, Web Developer, Theorem, Mysuru on 11th November 2017. Technical talk on “Implementation of Networking Ideas using Hardware Kit” for III Semester Students was conducted by Radhakrishna, Senior Software Engineer, Mar Labs Software Pvt. Ltd., Mysuru on 11th November 2017. Technical talk on “Programming Concepts & Techniques” for I Semester Students was conducted by Charles Antony, Learning and Delivery Head, RIIIT Ltd, Mysuru on 11th November 2017. Technical Talk on “Recent Trends on IoT and Cloud Servers” by Chandraprasad R, Senior Team Lead, Theorem, Mysuru for VII semester students on 11th November 2017. Three Day Workshop on "Internet of Things (IOT) using Raspberry Pi" was organized with Resource persons Mr. Deepak Singh, Corporate Trainer, and Mr. Divyang Sorathiya Assistant Trainer, Monkfox, Bengaluru on 26th , 27th & 28th of April 2017. Two Day Workshop on “Ethical Hacking and cyber Security” for VI semester students by Samarth B Bhat,Founder and Director,RevEngg, Bengaluru on 27th & 28th March 2017.
on 15th , 16th and 17th March 2017. Technical talk on “Efficient Techniques to deal with Web page Complexity” by Sunil, Cofounder, Linus Technia, Mysuru for VIII semester students by on 11th March 2017. Technical talk on “Shell Programming in Industry Perspective” for VI semester students by Harisha K C,Account SME, IBM (India) Pvt. Ltd., Bengaluru on 11th March 2017. 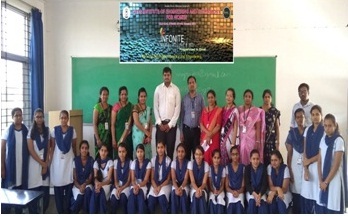 Three Day Workshop on “Challenges in Enterprise Network Environment” for VI semester students by Mr.Kishore Babu, Sr. IT Support Engineer, Computer Solutions East Pvt. Ltd, Bengaluru from 20th to 23rd January 2017. Department of Computer Science and Information Science & Engineering of Marri Laxman Reddy Institute of Technology (MLRIT), Hyderabad organized the “National Convention and Conference on Digital Economy (NCDE-2017)” on 6th & 7th of April 2017 in association with Computer Society of India (CSI). Eight teams had participated in the Paper Presentation, out of which three teams won the prizes. Management, Principal, HOD’s, Staffs & Students of Department of CSE & ISE congratulate the winners of Paper Presentation. Ranjitha C S & Meghana B R of CSE won the 1st Prize, Amtul Sadiya Serwari, Jannavi, Kamarunnisa K M & Ranjitha P of ISE won the 2nd Prize, Aishwarya T, Nehal B & Pooja M of ISE won the 3rd Prize respectively. Department of Computer Science &amp; Engineering and Department of Information Science &amp; Engineering had organized one day National Coding Competition “CODE IGNITER – 2016 ” in Association with Computer Society of India, Bangalore and Mysore Chapters on 27 th August 2016 in M. Govind Rao Memorial Auditorium of GSSSIETW, Mysuru at 9.30 AM. National Level Coding Competition was inaugurated by the Chief Guest Mr. Rajesh Kutnikar, CEO, IT Champs Software Pvt. Ltd, Mysuru, Guest of Honor Mrs. Aruna Devi, Hon. Secretary, CSI-Mysore Chapter, Smt. Anupama B Pandit, AAO, GSSSIETW, Convenors Dr. S.Meenakshi Sundaram, HOD, CSE and Dr. Reshma Banu. HOD, ISE by offering flowers to Visionary and Founder Secretary Prof. B.S. Pandit. (From left) Dr.Reshma Banu, HOD, Dept of Information Science and Engineering, Smt. Anupama. B. Pandit, AAO, GSSSIETW, Mr. Rajesh Kutnikar, CEO, IT Champs Software Pvt. Ltd, Mysuru, Mrs. Aruna Devi, Hon. Secretary, CSI-Mysore Chapter, Dr M Shivakumar, HOD, Dept of E&IE, Dr. S. Meenakshi Sundaram, HOD, Dept. of Computer Science & Engineering. The inaugural function began with the Invocation song by Priyanka Jain and Sneha S Narayan of III Sem CSE. Dr. Reshma Banu, HOD, Dept of ISE, as a Convener addressed the gathering about the importance of “CODE IGINTER 2016”. Mr. Rajesh Kutnikar, CEO, IT Champs Software Pvt. Ltd, Mysuru, in his talk emphasized about the importance of such Technical events for bridging the gap between Industry and Institute. He advised the students to become entrepreneurs and provide jobs to others. He also advised the students to distinguish themselves with additional skills and express themselves to be successful in their professional life. He suggested the students that getting into the job is not the end instead it’s the beginning of the career where one should involve in learning the underlying technologies efficiently. Mrs. Aruna Devi, Hon. Secretary, CSI-Mysore Chapter, addressed the gathering giving valuable insights into the importance of Communication and Documentation along with the Technical skills by providing various examples. She suggested the three key needs namely People, Process and Technology for projecting the business in a right way. Dr. S Meenakshi Sundaram, HOD, Dept of CSE, as a Convener presented the concluding remarks for “CODE IGINTER 2016” emphasizing on the process involved in organizing of the event. The Vote of Thanks was proposed by Sharavani of III Sem ISE. After the Inaugural function, around 450 participants from various colleges of Karnataka, Kerala and Andhra Pradesh participated in the Coding, Innovative Project Idea Presentation and Mobile App Development events. All the three events were judged by the experts invited from the industry. Coding was judged by Malathi M, Principal, ETA, Infosys, Mysore. Project Idea Presentation was Judged by Deepa Raj L, Test Lead, Vigyan Labs Innovations Pvt Ltd., Bangalore and Pavan Kumar S, Business Analyst, Oracle, Bangalore. Mobile App Development was judged by Karthik S, Managing Director, VSG Software Solutions, Mysuru. Nandan B N of BGSIT, Mandya, Preethi M S and Deepthi Singh of GSSSIETW and My Vote App presented by V Anand Vamshi Krishna and Sandeep Adhikari of Sambram Institutue of Technology, Bangalore won the 1st Prize in Coding event, Project Idea Presentation and Mobile App Development Events respectively. Dilna Vincient of GSSSIETW, Suhas Vittala and Sohan Kumar of HMSIT, Tumkur and CIT, Gubbi, Pro Line App presented by Balaji S, Tejas B Achar of DBIT, Bangalore won the 2nd Prize in Coding event, Project Idea Presntation and Mobile App Development Events respectively. Winners receiving the Cash Prize and Appreciation Certificates from the Conveners. Event Concluded with the valedictory function where Winners of each event were presented with Cash Prize and Certificate of Appreciation.